Battlefield Hardline is a clever sidestep for a multiplayer franchise that has, until now, focused on war. Instead of a global conflict, it features skirmishes between criminals and law enforcement; for the first time ever, there are no tanks in multiplayer. Consequently, much of the combat revolves around infantry and light vehicles. Player classes have been tweaked slightly, in an effort to differ from its predecessors, but the core tenets of the franchise have been retained. 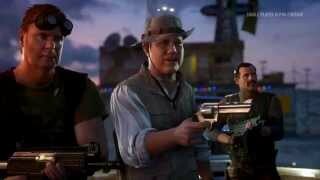 Although primarily a multiplayer experience, there is a single player component. 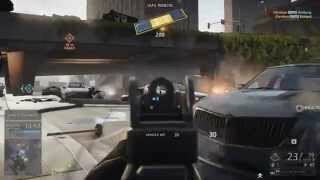 Developers at Visceral Games are best known for their single player titles, and they have tried to exploit the police theme in an episodic campaign that emphasizes stealth and non-lethal takedowns. Told across ten interconnected episodes, the Hardline campaign revolves around cocaine trafficking and police corruption. Players take the role of detective Nick Mendoza from the Miami Police Department and are initially tasked with finding the source of a new drug supplier. During your investigation, you become aware that one of your colleagues may be involved. Things are not as they seem though, as you clash with both sides of the law and the lines blur. The staging, presentation and pacing aspects are much clearer here than in previous Battlefield campaigns. Part of this is because each episode has a strong introduction and a fitting conclusion; unfortunately none of the cut scenes can be skipped, even on replay. There is good distinction between each episode as you explore attractive locations such as mangroves, deserts and an abandoned school. The characters are more believable too, although some are only involved for a few lines of dialogue. Your partner Khai, acted by Kelly Hu, has a starring role with smart dialogue. Fortunately you are never drowned in exposition and the main narrative moves along briskly. Careful pacing of action is a crucial aspect of the campaign. The prevalence of stealth ensures you spend more time in detailed environments. Hidden evidence, scattered around the levels, builds case files that piece the story together. There are many segments without action, allowing the game to build context for an upcoming sequence. For example, an early chapter has you exploring the everglades with an Airboat and it can be 15 minutes before you meet resistance. A later episode has Mendoza returning to a crime scene alone, just as hurricane makes landfall outside. The careful easing in and out of conflict, along with the support from the environments, produces some memorable levels. Although stealth is not required during conflicts, it is encouraged by limiting ammunition and rewarding you with weapons or online battlepacks. Many of the stealth areas are similar in design. First you get an overview of the area, such as a warehouse, and then you infiltrate with a choice of weapons and gadgets. Guards will patrol areas and you must avoid their vision cones to remain undetected. You can approach enemies with your badge and begin an arrest, but this somehow works when enemies are within earshot. If you are spotted without a badge, alarms bring reinforcements, so remaining unseen reduces danger. Unfortunately the stealth is basic and not all that satisfying after a few episodes. The guard placement is trivial and can be exploited. An endless supply of shell casings is used to distract a single guard, but the distraction range is pitiful and other guards do not care if their friends return. The main stealth caveat is that you cannot move bodies, so you must takedown enemies in the right places. Non-lethal takedowns are the only way you get points, so avoiding all guards is no better than creating a massacre. Once spotted, enemies are able to track you through walls. While it makes sense to discourage a detective from killing criminals, it can make you feel guilty for using the great weapons at your disposal. Even when pushed into unavoidable combat, you regret killing bad guys because you get no points for defending yourself. You can cheat the system by switching to the non-lethal tazer, but shocking enemies with hit and run tactics does not seem like an intended strategy. When you reach the maximum character level in the campaign, you can discard stealth and just shoot everything. Unfortunately the game rarely throws more than a handful of guards at you, preventing it from hitting a high gear. So while the stealth works, the implementation affects the shooting and needed more depth. The story is unfortunately packed with many irrational plot conveniences. One example occurs when you crash near a derelict gas station and discover the abandoned garage contains two pristine vehicles that will take you to the next area. During a car chase in the aqueducts, you are given infinite ammo to take down pursuers. Another chase is at the helm of a truck that makes enemy cars explode on contact, as though they were on their way to a Michael Bay film set. The worst narrative convenience is reserved for a primary antagonist that infiltrates your base with just two companions, not long after a mission where he was surrounded by dozens of associates. These absurd story elements are especially bad when most of the campaign strives to be grounded. Overall however, the decent Hardline campaign proves that Visceral are still skilled at leading players through a solo adventure. Online is suitably more chaotic than any part of the campaign, with subtle changes to the standard Battlefield formula. Infantry is the primary focus, with interference from deadly helicopters and fortified trucks. Death comes quickly from all sources, as damage models reward first to acquire targets. The cops and robbers theme is gingerly applied to the Battlefield mechanics, with the best application coming via hilarious callouts from characters. One criminal asked if this was ‘Police Academy’ due to the general ineptitude of the opposing team. The Commander role has been replaced by a ‘Hacker’ and he can interact with toxic gas and cameras. The experience never takes itself too seriously and carefully mixes the police theme into the franchise. The four standard Battlefield classes return, with a different weapon system. Rocket launchers are now pickups, either around the map or from vehicles, giving all classes the power to destroy armoured units. All of the primary weapons and pistols are isolated to specific classes, creating more distinct roles at the cost of some player choice. Class weapons are a mix of familiar and new, with some initially locked to a specific faction to force variety. The gun attachment system is more natural, as you can now purchase your preferred sight after only a handful of kills. Melee weapons have been given some attention, with blunt tools that perform non-lethal takedowns from behind. Although your victim effectively dies from a non-lethal takedown, they can be ‘interrogated’ to reveal the location of other enemies. Weapons, attachments and gadgets are purchased with funds you earn from playing the game, making it the best unlock system in the series to date. Several gadgets are shared across classes, including the grapple and zip-line. Both of these gadgets increase mobility and open new navigational paths. They are placed liberally across maps as pickups, so you do not need to sacrifice class gadgets. The grapple provides freeform rooftop access that would otherwise need a helicopter, so roof campers can be eliminated without needing to ascend booby-trapped ladders. The zip-line gadget is a great tool for making fast transitions between hotspots, but you need to be elevated from the target and the line is destroyed easily. These gadgets are best used in association with a specific map or game mode - the grapple is great when infiltrating a warehouse to rescue hostages and the zip-line helps avoid street combat in a bank heist. Selecting these gadgets can be wise for such scenarios, but they function great as battle pickups. 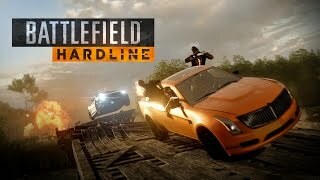 "An infantry focused spinoff that fruitfully exploits carjacking, aggravated robbery and mayhem"
Battlefield Hardline is ranked #442 out of 1434 total reviewed games. It is ranked #26 out of 110 games reviewed in 2015.